What are the benefits of our EQHSMS Integrated Management System consultancy and auditor training? Provides proper understanding of environmental issues. Increases customer satisfaction and retention. Reduces risk of accidents and incidents. Improves employees' motivation, awareness, and morale. Reduces waste and increases productivity. The IMS internal auditor training presentation is prepared by a team of highly-qualified and experienced management professionals and integrated system consultants. This EQHSMS auditor training presentation kit is very useful while conducting corporate training for internal audit of quality, environment, health safety management system within the organization or any work area. Our many clients in USA and several other countries have already used this IMS auditor training ppt for their employees. Completely editable IMS internal auditor training presentation kit is pleasingly designed and presented to clearly communicate the message and establish a much better understanding. Our custom-designed Power point presentation meets the requirements of QMS 9001, EMS 14001 and OHSAS18001 standard, and using this auditor training ppt our more than 200 clients globally have successfully implemented Integrated management system within their organizations, cleared the IMS audit and got certified to ISO 9001:2015, ISO 14001:2015 and OHSAS 18001:2007. 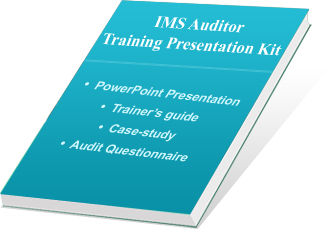 EQHSMS IMS Auditor training presentation kit contains total 390 slides in two parts - presentation and literature for participant’s further learning. Topic-wise IMS Training PPT Presentation Kit contains following 9 modules. Overview of ISO 9001:2015, ISO 14001:2015 and OHSAS 18001 Certification. EQHSMS integrated management system documentation process. Steps for EQHSMS IMS system (Quality, Health, Safety & Environment) installation. Practical auditing examples - Case-study 1, 2 and 3. Sample Audit templates to maintain audit records. Sample Risk template for EQHSMS - 01 excel file to maintain risk records. Sample of Internal Auditor Certificate to be provided participants, who attend training programs and successful solve the workshops and case studies. The soft copy of presentation and handouts are given; one can edit them as per their own requirements for Integrated Management System Certification. Developed under the guidance of experienced experts and globally proven consultants having experience of more than 20 years in ISO consultancy. User-friendly and easy-to-learn material; one can add company logo as well as voiceover for the training of staff. Our products are highly sold globally and used by many multinational companies and have provided total customer satisfaction as well as value for money. In preparation of training kits it is verified and evaluated at various levels of our team and more than 1000 hours are spent in preparation of this training presentation kit. Prepared by globally proven team of leading consultant. On successful completion of secured purchase, we provide username and password to download the product from our FTP server. We provide instant online delivery of our products to user by sending username and password by e-mail. View free Demo of IMS Training Presentation Kit and purchase complete product with secure online transaction via Paypal.com. Our products are sold in more than 65 countries.